So, let’s take a closer look at this sample of tumor tissue from a mouse. Actively dividing skin cancer cells (red) are seen invading healthy tissue as they grow. As these malignant cells spread, they leave other skin cells (green) in their wake . The blue dots in the image are nuclei of all cell types—the cells that are neither red nor green are blood vessels, fibroblasts, immune cells, and other cells that make up the “stroma” of the skin. Schober hypothesizes that if he can find a drug that can limit the ability of malignant cells to self-renew and can accelerate their differentiation into benign cells, the tumor will stop growing and eventually disappear. 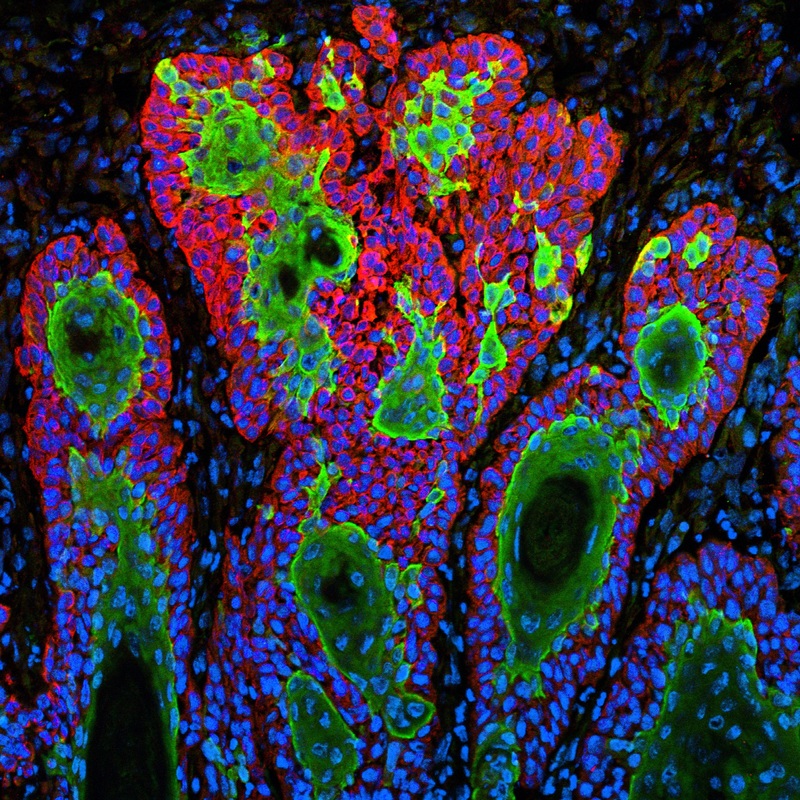 While such a result wouldn’t look that great (all the cells would be green), I’d definitely take a cure for this type of skin cancer over even the prettiest of pictures! In the meantime, if you notice any unusual spot on your skin that is changing over time, especially if it is darkly pigmented, I urge you to see your doctor. Most skin cancers, including SCC, are treatable if caught early. Also, keep in mind that the best way to prevent skin cancer is to reduce your exposure to the sun’s DNA-damaging ultraviolet radiation—by seeking shade, wearing clothing that covers your skin, and/or frequently applying sunscreen. Cutaneous squamous-cell carcinoma. Alam M, Ratner D. N Engl J Med. 2001 Mar 29;344(13):975-83. Tumor-initiating stem cells of squamous cell carcinomas and their control by TGF-β and integrin/focal adhesion kinase (FAK) signaling. Schober M, Fuchs E. Proc Natl Acad Sci U S A. 2011 Jun 28;108 (26):10544-9.